Ok, so if the last post was long, this one is CRAZY long! So now it's Day 29 - Inspired by the Supernatural! Now it was back to my childhood with these nails and I loved every minute down memory lane! As it's nowhere near Halloween I tried to make the nails as anti-Halloweeny as possible while sticking with the theme so here are Scooby-Doo nails! 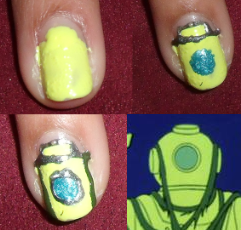 I decided to alternate Scooby gang and villain on my nails to make it more interesting! Some of these were pretty darn tricky (so be prepared for some time-consuming work!) but on the whole I hope they came out alright! 3) Use a black nail art pen to do an outline! 4) Finally add facial deets: eyes, eyebrows, nose and a mouth! Here I tried to add teeth but they didn't come out too well! 1) Similarly to Fred, use a black nail art pen to do the facial outline - an oval shape again and then her voluminous hair! For Daphne though remember to do an outline of her signature purple headband! 4) Use a yellow pen to give the eyes that eerie glow! 2) Using a brown, fill in Scooby's head! 4) Finish off with his eyes: paint on small white ovals. Once dry paint on the black pupils. Finish off with some eyebrows! 4) Finish off with some detail for his bizarrely square shoulders in dark green! Only three easy steps this time! 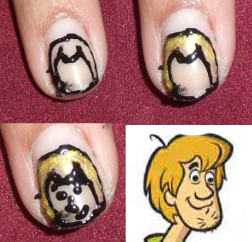 As you can see, I had a little trouble with facial detail - especially on Velma! Definitely something to work on in the future! ONLY TWO DAYS LEFT OF THE CHALLENGE!! !